Apple released an update for some MacBook and MacBook Pro models to fix an issue with slow wireless connection on battery power after the Mac OS X 10.5.8 update. The update is for the following models: 13-inch MacBook: Late 2007, Early 2008, Late 2008. 15-inch MacBook Pro: Early 2008. 17-inch MacBook Pro: Early 2008, Late 2008. Via TUAW. Hi, I would like to know if a MACBOOK can connect to any wireless modem or we need a Airpot device(Airport Express) seperately? MacBooks can connect to any normal wireless device. Thanks Khaled, but i was under the impression that MacBook can only connect to WEP security not WPA2. Please correct me if i’m wrong. My wife’s computer (which is an early 2008 17″ MacBook Pro) is having trouble with a slow wifi connection, but she’s now running Snow Leopard. 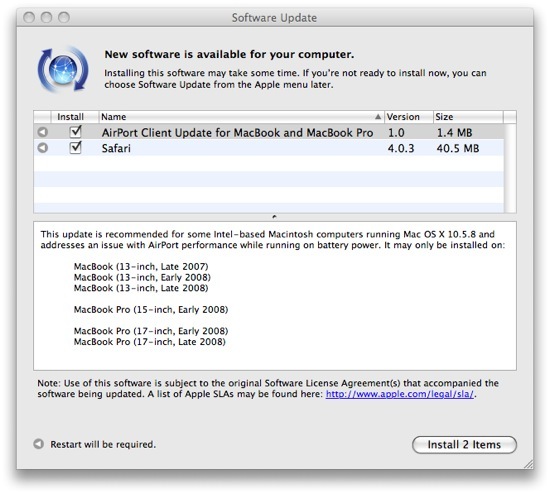 Would this update still apply? if the update is available then yes. I suggest you have a look at the AirPort Utility, did you update the firmware?